Famous FishDuck Writers–Remove Mullens: PASS or NO PASS? Something I’m seeing on message boards, in the comments at FishDuck.com and in emails to me — is that quite a number of Oregon fans want athletic director Rob Mullens fired over the 11 million buyout to Mark Helfrich, coupled with being bamboozled by Willie Taggart. I have my doubts about faulting Mullens. Firstly, he felt he must secure the institutional knowledge of the Chip Kelly/Mark Helfrich offense by placing a big buyout on Helfrich’s contract — and it comes back to bite the athletic department when MH is fired. Then, he places a smaller buyout with Taggart — so as to not get caught again like that, and it leaves the door open for Taggart to leave the Ducks in a heartbeat. It is harder than it looks being an AD. You can’t have both components written into the contract to benefit Oregon and actually sign a good coach since nobody knows the future. Which strategy do you choose with a buyout? Either way you could be wrong as it appeared with Mullens. Yet others can point to how Oregon has been the top performing athletic program in the Director’s Cup for 10 years among schools with 19 sports or less. That means Mullens has maximized the resources at Oregon the best of anyone in the US with the same budget and sports. He won’t get fired for that track record. 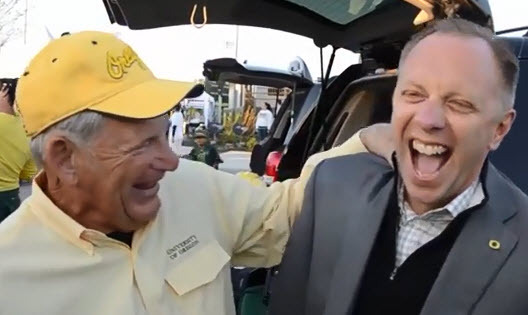 Rob Mullens after a Duck Victory. Also, Mullens has a history of firing coaches who are not in the top third of the conference at their sport after giving them a fair chance to turn things around. Soccer is an example, along with Lacrosse, the coaching carousel continues until he finds a winner. And boy did he find ones for women’s basketball, softball and track. Firing Mullens is not so easy and I’m not sure it is the right thing to do. I’ve invited the Famous FishDuck Writers again for their opinions and, as always, I welcome yours. I think “Not fair” but I’m willing to be talked to the other side if Mario Cristobal proves to be out of his league. I’m as Title IX as the next guy (probably more than a lot of males), but it is football that makes my heart beat. I think having a top women’s basketball team is dandy, but we are in Jokeland right now as a football program. We have been chasing our tail for several years now. Obviously, the Helfrich hire was a dumpster fire full of crap and Mullens must eat that one by the mouthful. But one ridiculous hire and the Taggart “et tu, Brute?” in the back doesn’t mean Mullens has to go … yet. If Mario fails, then Mullens must leave town with him. He has taken the easy way out by hiring a guy not ready for prime time (MH) who lost the team, the hire of an east coast guy who had an overall losing record in the Group of 5 (WT) and the hire of another guy who had a losing record in the Group of Five. 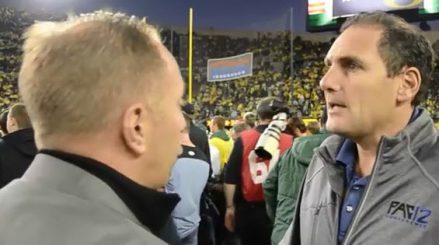 (MC) Why should Ducks fans be in a position to justify the latest football coach’s losing record? Jon Joseph is not thrilled with Pac-12 Commissioner Larry Scott either. These hires might be acceptable if Mullens was operating on a shoe string; it is not acceptable with Uncle Phil on the scene. Oregon is not the school up the road in Corvallis. Did he even make an effort to go after Kevin Sumlin, a great recruiter and a guy who made the best out of a bad hand in the SEC West? Mullens, being in Grapevine, Texas, and helping to grease the wheels for the SEC as the Taggart stuff went down, is akin to Nero’s fiddling. I for one would love to see where he had USC on his final ballot. 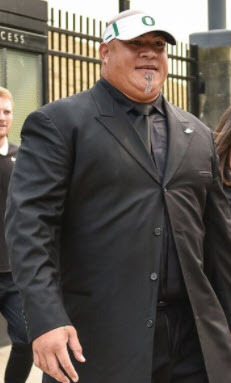 Did he put up any kind of fight for the Trojans, a team with a better SOS than Alabama and Ohio State; or, did he roll over to win points for his next job posting? He got a pass with Helfrich, and Taggart turned out to be a fiasco. I certainly hope that Cristobal will prove to be the guy. But if he isn’t successful, then the person who hired him must also be canned. So, I reiterate, IMHO the jury is out on Mullens. Mullens has a tougher inherent situation with football than with other sports, I think. It’s football in which Oregon has the greatest recruiting weakness in terms of attracting kids from the state or region who are good enough to be three or four-star Division I talents. If he hires someone with connections to recruiting hotbeds, it risks that person being tempted to leave. If he hires someone who is from here and wants to stay, they may not necessarily have the recruiting connections. Rob Mullens with Rich Brooks. When Mullens hired Helfrich, it came as part of a long-standing tradition of promoting assistant coaches, a strategy that had paid big dividends as we went from Rich Brooks to Mike Bellotti to Chip Kelly — and I think most all of us supported that move. We wanted to see Oregon’s spread offense continue, and even though in retrospect we probably should have hired Chris Peterson, not many of us were making that argument at the time. I think Helfrich would have achieved something equal to or perhaps even better than 7-6 this year, but the recruiting clearly was not good enough. 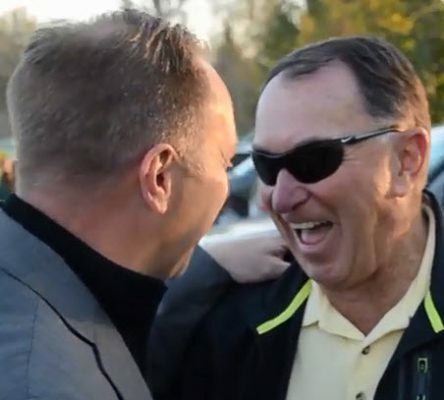 When he hired Taggart, we all bought into the idea that Taggart’s Florida recruiting connections could be a game-changer for Oregon. And they were! Until he discovered Eugene is very different culturally and climate-wise from his home state. Mullens must have known he was taking a risk hiring an ambitious program-jumper from the opposite corner of the country, but most all of us were quite tantalized by the recruiting boost and believed in the hire. Mullens wasn’t the only one blindsided to the risk of Taggart leaving so soon. We all under-estimated what, in retrospect, was a big risk all along. We all deserve some blame for that, because we were arrogant enough to believe that Oregon wasn’t a program one would walk away from for a multiple championship winner like FSU. I agree with writer Jon Joseph in at least one sense: that Mullens took a risk hiring Cristobal over Kevin Sumlin. Sumlin is a proven winner and a great recruiter who seemed to be an excellent fit. And not hiring him reminds me of something my dad, a veteran, once told me about war: that we tend to apply the lesson learned from the last war to our next war, when that lesson may no longer apply. We passed on Sumlin because we were afraid he might leave quickly like Taggart. But that may not necessarily have been the case. Even so, to me Cristobal was worth the risk and has a chance to be the best of both worlds: he has the same magic touch with recruiting that Taggart does, and the connections to recruiting hotbeds, but he actually seems to like living in Eugene and raising his family here. His family is just as far away as Taggart’s, but he seems to be interested in putting down roots in a way Willie didn’t. It’s certainly true that Cristobal doesn’t have even close to the track record Sumlin does as a head coach, ultimately what we’re buying with Cristobal isn’t simply the man himself but the opportunity to keep this incredible coaching staff together. And on that front, Cristobal and Mullens have been successful: an investment in Cristobal as head coach has ultimately allowed us to keep great assistants like Jim Leavitt and Joe Salave’a. Let’s suppose that Oregon doesn’t reach a January bowl in the next couple years. Will that be grounds to fire Cristobal? I say maybe, maybe not. The next time Oregon experiences some disappointment on the field, I’d like to see us stick with our guy. Our success from 2009-14 was built in part on the fact that when Bellotti and Brooks experienced setbacks–we stuck with them because they were building something. A friend of mine is a musician and one of my favorite songs of his is one called “A Brief Conversation Ending In Divorce.” The refrain as the song ends, shouted many times by the singer, is, “I THOUGHT WE WERE BUILDING SOMETHING!” And that, to me, whether we’re talking about Mullens or the head coach, rings true: to have a great program, we need to be building something, not just tearing it down and re-laying the foundation every time there’s a problem. My opinion and take on Mullens makes me an outlier in the realm of this long and getting longer discourse. I don’t care for his performance and put the responsibility for Ducks Football falling from national title class football to “also-rans” directly on him. 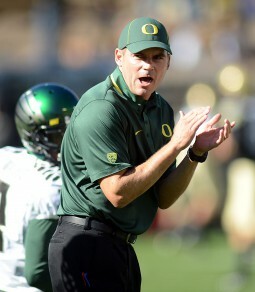 Who IS responsible for Coach Mark Helfrich? A writer above recognizes the overall excellence of the UO Athletics program, and that is fact. UO sports programs have mostly been compliant with NCAA regulations and student-athletes have emerged and progressed while fielding nationally ranked teams and won championships. But Football is the prize that drives revenue and reputation. I don’t see future consistent Top Ten finishes coming again under UO President Michael Schill, who wrote me two years ago and explained that he fully supports AD Rob Mullens. I have had it with both of them as far as the football program goes. They are satisfied I’m sure if the Ducks are +/- 25 rank and the public and NCAA waves are calm. The idea of firing Rob Mullens due to issues with football is incredibly narrow-minded. Football is the revenue juggernaut and stirs the drink at the university, but when it comes to on the field success, it is not Oregon’s strength. 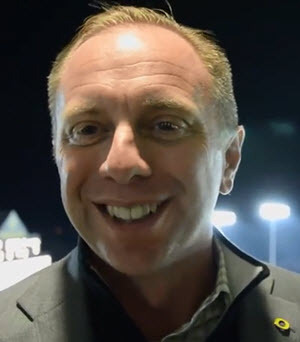 Football is a cash cow and if the question is whether Rob Mullens has protected it, then we can argue that point and if he should keep his job. However, if we are arguing on the success of the university in athletics under his tenure, he should get an extension and raise. Since the summer of 2010, when he took command of Oregon athletics, the program has won 17 men and women’s team national championships. Oregon has also fielded teams that have been national runner-ups in football, volleyball and golf. 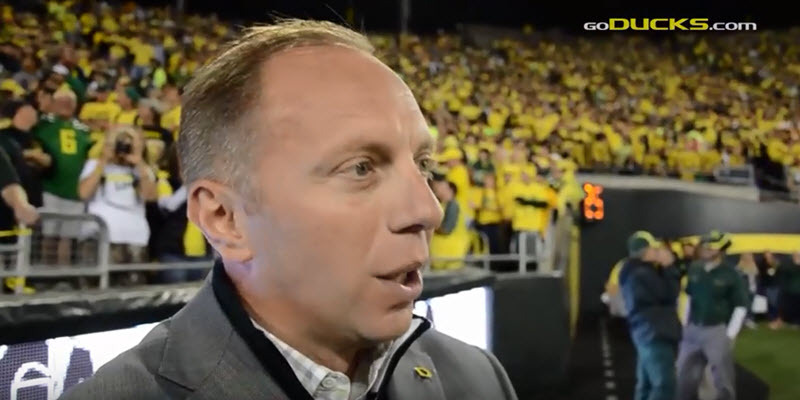 That is a clip of three team national championships per year at Oregon since Rob Mullens ran the department. Not too shabby for a university I would say. 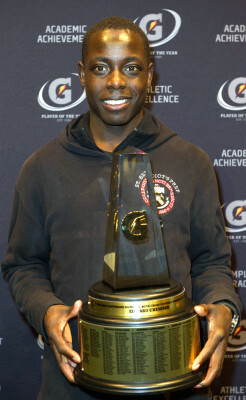 University of Oregon athlete, Edward Cheserek, was named the NCAA Cross Country Athlete of the year in 2014. I understand the premise of our entire discussion here is football and we think the sun needs to rise and set on the program. Financially, I say yes it does as DAF independently supports Oregon athletics and a majority of those funds come through football donation. Does the university need to look at the strategic planning associated with the recent hirings? Of course. Does the university need to re-evaluate the football revenue stream to see how to adjust things to secure and continue high donations and fan participation? Absolutely. You see, it is ripple effect. Because Oregon became nationally viable in football, the university’s athletics on the whole became better. Oregon was able to offer world class facilities, training, tech and gear due to the affiliation with Nike and the incredibly large account that was supported by football with it’s national prominence and success. At the end of the day, it boils down to money and not the record of the football team, or even who the coach is. Helfrich was fired not because of 4-8, he was fired because thousands of season ticket holders threatened to walk. What Rob Mullens is attempting to do is to maintain the status quo. As long as Oregon football keeps fans interested and paying, then his job is fine, regardless of record. At the end of the day, Rob Mullens is judged by what the athletics department makes in revenue and not what it does on the field. To both counts — currently Rob Mullens is doing just fine. I’m not sure how often any of you hire people. For me, its often. And I hire people who will be responsible for pretty big projects. Mullens has fun with a fan. It ain’t easy! And there is often luck (good and bad) involved. Perhaps that is one reason why I am not too critical of the decisions he has made. I understand why he made them, for the most part, and cannot disagree with his logic. Will his latest hire work? I can’t blame Mario Cristobal for having a losing record where he was the coach under the conditions he coached under at FIU, just as I could not blame Mullens for hiring WT with a losing record — FSU did too! Holy Crap — the Famous FishDuck Writers have spoken and really opened the discussion in a ton of directions. So what do you think; does Mullens get a pass?